Let’s celebrate the start of school with a great giveaway! 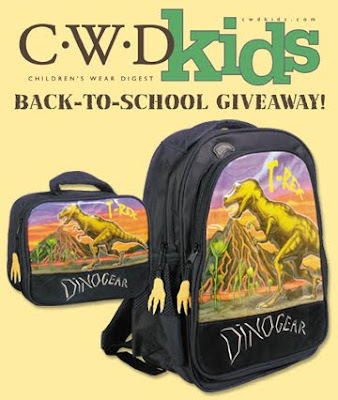 We want to send your child off to school in style with our newest arrivals, the Dinogear back pack and lunch box, and a $25 CWDkids gift certificate! Post a comment here or on our Facebook wall and tell us which CWDkids outfit your child would love to have to start the school year. We will choose one lucky winner from all comments posted by Tuesday, August 25, 2009. My son would love to wear the Peace Drum Kit T-Shirt. He loves music and is in two different classes this fall. He would love to express his musical talents in his new shirt! My daughter loves horses, so any of the horse outfits! But her fave is the Mulberribush horse tunic and striped leggings. My son loves anything dinosaur. My daughter keeps opening the catalogue to the flower skirt/green mock turtleneck outfit. She thinks it is awesome! And my son would love to sport any of the Star Wars long-sleeve T-shirts. It would replace the short-sleeve one he's been living in all summer! After browsing through the new catalog, my granddaughter insists that she needs the polka dot peignoir set & matching eye mask for the school year. For school I asked? She said "Oh yes, I will need to be well rested to do my best in school." My daughter loves brights! She would LOVE to be wearing the Mis-Tee-V-Us purple & green double sleeve flower dress w/purple leggings. Sadly she has to wear uniforms to school. My son would LOVE the tractor tee! I'd go with the denim pants to match. A Star Wars layered look tee for my youngest son, and some Anita G dresses for my three girls. My son Xavier would love to own the "I Have a Wild Imagination" shirt from the movie themed tee's collection and coordinating cargo pants. His personality is just as wild as his dreams and that outfit is him through and through. FOR THE FALL, My daughter would love to have the owl sweater dress. it's cozy and warm. my son loves wes and willy sweaters. that company really know what boys like. from cars to ninjas. Love the Anita G dresses and of course the Ralph Lauren. My daughter really wants the nightgown with peignor. My daughter Katy, entering the 3rd grade this year, would love to represent CW Kids in our "City of Ships" in Bath, Maine. Katy and a small group of friends have been selected for an exclusive children's choir and we're excited to watch her perform. She would look so cute on the risers wearing the Daisy Dot Dress, the solid brown leggings to match, and she would be through the moon to top the outfit off with the Riding Boots in the new patent leather finish. We are always excited to receive the new emails from CW Kids. Katy is a flower girl in her Zia's (aunt's) wedding and is wearing all CW Kids!!! hmtdesigns@gmail.com. Ever since my little girl was a baby I called her Hannah Hooie. This nickname lead into her collecting owls. She would love the blue owl dress and lace hem leggins to wear to Preschool this fall! My granddaugher loves to wear dresses. She twirls and spins around the house to make them flare with fun. She would look adorable in the horse pattern dress and brown cowboy boots! My youngest would love wearing the dinosaur sweater and matching twill pants! With 3 boys and no girls, I am often envious of the cute clothes for girls. So many of the boys clothes I see in stores all look the same, but not at CWD!! The new "Rock On" line is so adorable (I guess the boys would prefer I say-awesome!) I really love the black fleece that says "ROCK" on the front and the "Roadie" t-shirt is very clever! Thanks, CWD, for giving us mom's of boys some fun clothing choices! My little man Caden would love to have the Ed Hardy Tiger Tee along with the Polo Classic Jeans. He says he wants to look "wicked awesome" like his older cousin Austen. He's even figured out how he wants his hair to be when he wears his new shirt...in a mowhawk. It's against school rules so Mom says NO! But he'll look super cool anyway!! Our girls' favorite new item are the Hartstrings Toile print dresses w/matching tights. Too cute!! I am a mom of four and I love CWD Kids! My daughter is in love with the Pinkalicious Pajamas!! My son would love to wear the Wild Things Monster tee and the Classic Jeans. He's just starting kindergarten this year, but he loves to let his personality shine through on his clothes. And I think every now and then we all feel a little like a wild thing! Thanks for the chance to enter! I had my DD look through the dresses and she picked out the purple Pearl Edge Dress by Mulberribush. I thought it was a great choice! My niece and godchild is a HUGE owl fan, wearing everything from owl jewelry and clothing to sleeping with a large stuffed owl at bed time. The corduroy owl dress would be the perfect dress for her to start school in while she is adorned with all of her owl accessories! My boy would look so adorable in the long-sleeved striped rugby. Ah, and I've been admiring those vintage-looking alligator shirts for months. I love your selections! I would pick a Wes and Willy tee for my little boy! So cute!